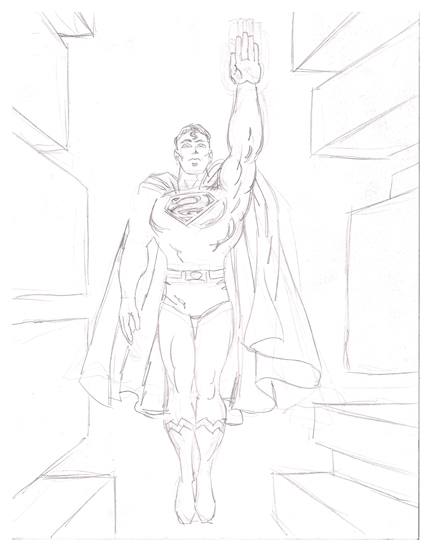 The theme for November 9th’s Akron Comicon will be 75 Years of Superman. For that occasion I’ve created this color illustration. 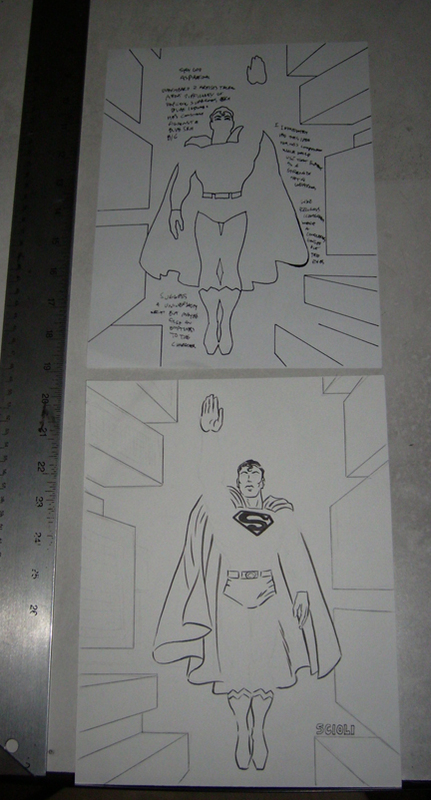 At this year’s Phoenix Comicon I overheard two artists talking about the difficulty of depicting Superman. The problem is that he has a sky blue costume and is constantly flying against a blue sky background. This idea for this illustration immediately revealed itself to me. I’d use that element as a strength, rather than a weakness. I began this drawing as I’ve described these other process drawings, rough sketch, flip the paper over to do a tighter pencil on a lightbox, then flip it back over to ink. 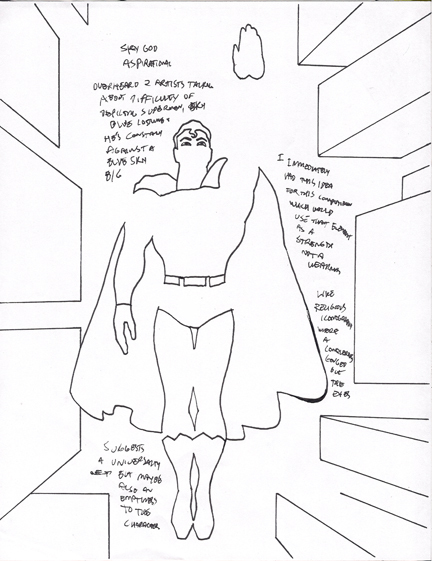 I gave everything a contour line except for his costume to really make it blend into the background. Note the missing eyes, like a painted religious icon where a conqueror gouged out the eyes. On a separate sheet of typing paper I lightboxed a line drawing to indicate areas of color to make the color-flatting process easier in photoshop. This saves me from having to click-click-click an outline around every shape. 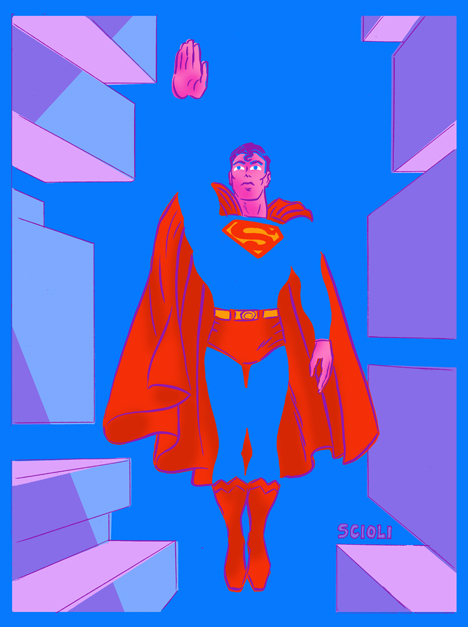 The end result presents Superman as an aspirational sky god. The “painted on” eyes hint at similar flourishes in Hindu statuary. The absence of the costume suggests a universality, but maybe also an emptiness to the character. I keep trying to stifle my fannish impulse. I strive to be an iconoclast, not a pious delineator of illuminated manuscripts. I can’t stop myself. I love comics, and superhero comics most of all. As with previous process posts, I’m selling the original artwork on my Etsy page. 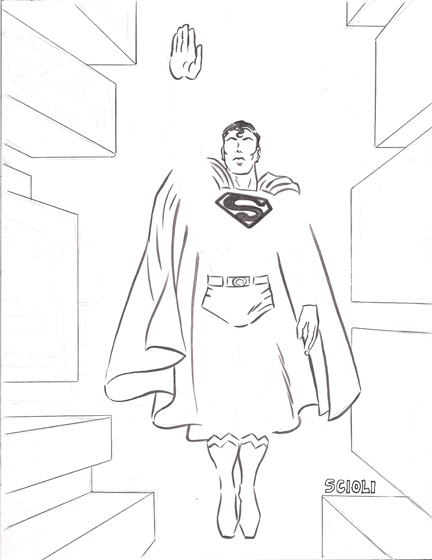 Click here to purchase: www.etsy.com/listing/154719261/superman-drawing-by-tom-scioli? Amazing. Will you be selling prints of this at Akron Comicon?